WASHINGTON - Inside the government, some officials called her "Wayward Storm." 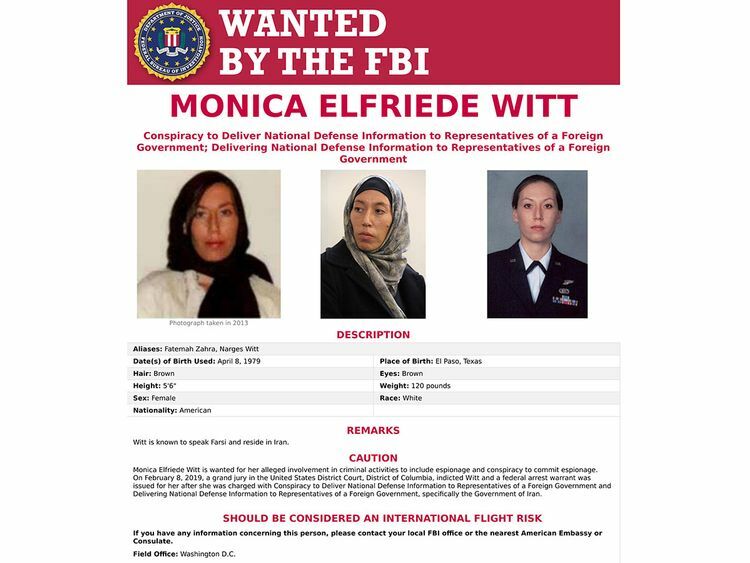 Her real name was Monica Elfriede Witt, an exemplary Air Force counterintelligence agent who had studied Farsi and carried out covert missions in Iraq, Saudi Arabia and Qatar. But by mid-2013, Witt had become disillusioned with the government - why, exactly, remains a mystery - and had left the military. Thoughts of betrayal consumed her, federal prosecutors now say, until she finally acted on them at the Iranian Embassy in Kabul, where they say she "told all." "They are going to get back to me on if they can help me very soon before I leave," Witt wrote on June 30, 2013, to an Iranian-American reporter working on behalf of the Iranian intelligence services, according to a criminal indictment. That indictment was made public Wednesday as the Justice Department accused Witt, 39, of defecting to Iran in August 2013 to work with Iran's Islamic Revolutionary Guard Corps in betrayal of the United States. Witt has been charged with two counts of espionage and other crimes for what prosecutors said was her help to the Iranian government with spear-phishing attempts that targeted her former colleagues. Investigators also said she provided the Iranians with secret details about U.S. intelligence operations. She is believed to still be in Iran. Witt's case is among several in recent years in which prosecutors say a foreign country, particularly China, has tried to recruit former American military or intelligence officials. "The case unsealed today underscores the dangers to our intelligence professionals and the lengths our adversaries will go to identify them, expose them, target them, and, in a few rare cases, ultimately turn them against the nation they swore to protect," John Demers, head of the national security division of the Justice Department, said in a statement. Authorities did not say whether Witt caused any damage to U.S. intelligence operations, but any programs she gained access to while in the Air Force would probably have been considered compromised. She also worked closely with the FBI on counterintelligence matters, and she knew the identities of Iranian informants the U.S. intelligence agencies were using. Witt was born in El Paso, Texas. She entered the Air Force in 1997 as part of the Office of Special Investigations, which conducts counterintelligence inquiries in the United States and overseas. She studied Farsi at the Defense Language Institute in Monterey, California, and went on to focus on collecting the intercepted communications of foreign adversaries. She left active duty with the Air Force in 2008 but spent another two years working as a contractor. She helped manage the same highly classified program involving informants working against Iran. A person familiar with her case said she had grown disgruntled while working for the Air Force and at some point had become enamored with Persian culture and converted to Islam. In early 2012, she traveled to Iran to attend a conference called Hollywoodism. Prosecutors said the conference is sponsored by the Revolutionary Guard, an elite Iranian paramilitary force, and is intended to promote anti-American propaganda. While at the conference, she agreed to appear in at least one video in which she was identified as a veteran and made statements that were critical of the United States. The videos were broadcast by Iranian news outlets. After her return to the United States, the FBI visited Witt, the indictment said, and delivered a warning: Iranian intelligence services were trying to recruit her. She told the FBI agents she would never reveal the work she did for the Air Force. The Iranians continued to target Witt, according to the indictment. In June 2012, an American-Iranian journalist, Marzieh Hashemi, came to the United States and hired Witt to work on an anti-American film. In 2013, Witt traveled to Iran again for a Hollywoodism conference and met with members of the Revolutionary Guard and expressed views critical of the United States. She also stated her desire to immigrate to Iran, prosecutors said. The indictment said she communicated frequently with Hashemi who is identified as "Individual A." She told Hashemi the work she had done for the Air Force was "evil." She also talked about exposing a secret program and "do like Snowden," a reference to Edward Snowden, a former National Security Agency contractor who stole sensitive documents and gave them to journalists. Witt eventually traveled to Afghanistan to teach English, and while there made contact with the Iranians. But she became frustrated when the Iranians treated her with suspicion. She talked about going to Russia where Snowden was living. "I think I can slip into Russia quietly if they help me and then I can contact wikileaks from there without disclosing my location," she wrote to Hashemi. Apparently the Iranians became alarmed and moved quickly to make sure that did not happen, giving her money to travel to Iran. "They are giving me money to head to Dubai," she said in a message to Hashemi. "I will wait to get the approval; there and get it from the embassy in Dubai. They are so kind ... even taking me to the airport." Witt appears to have been in Tajikistan when she wrote the email. Prosecutors described how Witt sent Hashemi an email in August 2013 titled: "My Bio and Job History." It included her discharge papers from the military. Hashemi forwarded them to an email address associated with Iran. Prosecutors accused Witt of defecting to Iran that month and working with the Revolutionary Guard to betray her country. The paramilitary group is known to carry out assassinations and cyberattacks around the world and has been penalized by the U.S. government. When she arrived in Iran, officials provided her with housing and computer equipment. Prosecutors said that she searched Facebook accounts for Americans and created "target packages" for Iran against U.S. counterintelligence officials. In late 2014, prosecutors said, Iranians working on behalf of the Revolutionary Guard began targeting Witt's former colleagues using a fake Yahoo email address and Facebook account. Prosecutors said the Iranians tried to put malware on the computers of the Americans to capture their keystrokes, gain access to web cameras and monitor their activity. A former senior administration official said Witt was also involved in the questioning by Iran of 10 American sailors who were captured in 2016 patrolling in Iranian waters. The sailors were released after about 15 hours. Former officials said Witt maintained a low profile as the criminal case against her moved forward, with a grand jury in Washington recently interviewing at least one witness: Hashemi, the journalist. Hashemi was born as Melanie Franklin in Louisiana and moved to Iran more than a decade ago after converting to Islam. She is now a prominent reporter for Iran's English-language Press TV. Hashemi was arrested in St. Louis while on a trip to the United States to visit relatives and brought to Washington. Officials later disclosed she was a material witness in an unspecified criminal case, the details of which were closely held until Wednesday. She was later released.